Summer is an ideal time to get started on felt wall hanging kits for Christmas. Once the holiday season arrives, there's little time left for crafting. Getting started early means you'll be ready before the holiday rush begins! Visit the Seasonal & Holiday Kits section of the store to see our newest selection of felt Christmas kits from Bucilla. Designed by Mary Engelbreit, this beautiful felt wall hanging will add sparkle to your holiday home decor. Mary's signature style shines through in this whimsical design that is sure to make every passerby smile! This felt applique embroidery kit includes stamped felts, cotton floss, sequins & beads, needles, and instructions. The finished size will be approx. 18" x 21-1/2". Create a lasting keepsake for the holidays with this creative felt applique design featuring 4 fanciful penguins holding on to the uniquely decorated letters spelling out the word "SNOW". Start on your felt Christmas wall decor kits now and they'll be ready to display when the holiday season begins! Click on the image to see all the details. Here's a Christmas wreath that will last, not only throughout this season, but for many more to come! This felt applique craft kit includes stamped felts, cotton floss, metallic thread, sequins & beads, needles, and instructions. 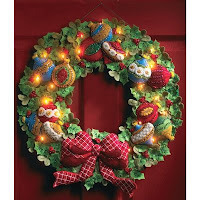 This felt wreath also includes a string of 20 clear lights for added special effect. Turn on the lights and this wreath will shine! 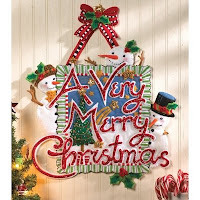 Felt Christmas wall decor adds to the festive ambiance of the holidays. Your completed wall hanging will become a family favorite to be enjoyed every holiday season. We're continuing to add to our Seasonal & Holiday Kits section, so be sure to check back often for new product arrivals. Visit Weekend Kits to explore a variety of creative project kits and be ready to create something new for the holidays on your next Weekend at Home! New Baby Quilt Kits for Beginners! Kid's Craft Kits - Learn a Craft Kits for Kids!